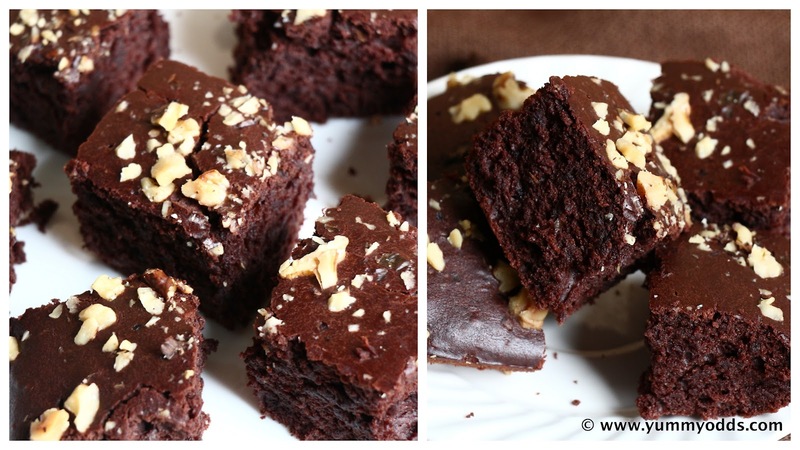 My Kids and Vj are typical chocolate lovers at home and they fall for Brownies anytime. I have started making brownies with Store Bought Mix at home initially, and then moved to next step by buying in Bulk from Costco ( Ghirardelli Triple Chocolate Brownie Mix is the best) and keeping it handy in the pantry and making it whenever I have 10 min. These days I am even moving another step ahead and started collecting Brownie Recipes and detrmined to make variety of Brownies from Scratch at home. In that attempt I have come across this wonderful recipe from Nag's Space and I simply followed her recipe, At first I was so skeptical with out egg how can i get that spongy and soft texture in brownies, but looks like the Vinegar did the trick to get the real texture in this recipe. I have literally crossed my fingers while the brownies are getting baked, Voila, at the end I got stunned with the end result! What do you think? Here is the recipe, Njoy! Pre Heat Ovent o 350 F or 180 C.
Mix Milk and Vinegar and set aside at room temperature. Coat the Baking Pan with butter or olive oil or pam spray, run it on all corners and sides, and set aside. In a medium bowl, swift together APF, Cocoa Powder, salt, Baking Soda, Coffee Powder. To this add powdered sugar and mix well until combined. In separate bowl, add Oil, Milk + Vinegar Mixture and Vanilla Extract and Whisk it together until everything is well combined. Now add dry flour mix to wet ingredient mix and fold it gently ( up and down) until no streak of flour left and everything is well combined. Transfer this mixture into erased baking pan ( 8 x 8), add roughly chopped Walnuts on top. Bake in the pre-heat oven for 25 to 30 min. ( until Toothpick or skewer comes out clean). Once it is done, take it out and let it cool in the pan for 5 to 10 min, cut the brownie into squares and store in the air-tight container. If you don't have vinegar handy you can replace 1 Cup Milk + 1 tsp Vinegar with 1 Cup Buttermilk. (1 cup Milk + 1 tsp Vinegar = 1 cup Buttermilk = 2 Eggs), you can use this equation vice versa in any eggless recipe to replace 1 to 2 eggs. When you are serving you can dust some powdered sugar on top of these brownies to give some fancy effect. Look at their cracks and texture! So soft and Spongy!